The purpose of a garbage disposal is to effectively grind up food so you can safely eliminate the waste. As a result, disposers tend to make quite a lot of noise. Still, that doesn’t mean that you can’t find models that aren’t that loud. If you plan on using your unit frequently, you should invest in the best quiet garbage disposal possible. We have collected the quietest models from the best brands, all so you can enjoy a peaceful grinding experience with your quality garbage disposal. Discover them below! Before we provide all the juicy details for the best quiet garbage disposal options of the year, here is the 411 for each. We have briefly outlined the dimensions and weight for each model, but also the horsepower and RPM ratings. For more information about a certain model, scroll down to its individual review. The general rule with garbage disposals is that they should not be used in homes with septic systems. Be that as it may, InSinkErator changed the game with the Evolution Septic Assist garbage disposal. The unit is one of the top quality models in its class, with a number of cool features that resulted in a grand customer rating average of 4.5 stars on Amazon. With a list price of around $265 on the website, it’s the most expensive disposal on our list, but the benefits are worth the investment. 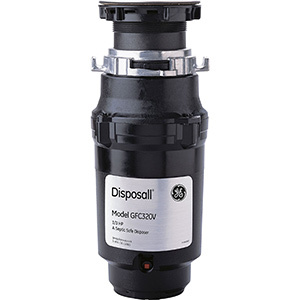 If we could label any food waste disposers as “beautiful”, the Evolution Septic Assist would be at the top of the list. It has a matte black finish that discretely blends into the setting under your sink. While its size may not be a disadvantage to those who have space to spare, you should note that the Septic Assist disposal is rather stocky. The model weighs a total of 22.4 pounds and has 14 x 11 x 16-inch measurements all around, so make sure you check the room you have available before ordering it. 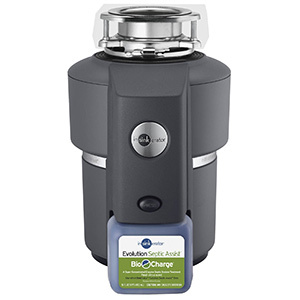 With features like SoundSeal and Bio-Charge technology, this InSinkErator is the best quiet garbage disposal that’s also environmentally friendly. The ¾ HP 1725 RPM works with MultiGrind technology to break down even difficult foods. Most importantly, the Septic Assist feature allows you to install it in homes with septic systems. Unfortunately, there are multiple complaints regarding the bio-charge canister, particularly regarding fluid spills and that replacement parts aren’t available for it. We definitely recommend the InSinkErator Evolution Septic Assist for homeowners that require septic system support from the best quiet garbage disposal. The model is of premium quality and will most likely withstand more than a decade of constant use. If you’re not handy with assemblies, it may be best to get your garbage disposal professionally installed. Nevertheless, if you’re fairly good with home improvement, you should certainly save yourself the average $185 it costs for a specialist to set yours up. One particular unit that’s super easy to mount on your own is the Waste King 9930, which features the brand’s signature 3-bolt mount system. You can currently buy it for roughly $110 new on Amazon. Despite the fact that it’s not the best-selling Waste King garbage disposal, the 9930 has tons of perks that will catch your attention. For starters, the model has a manual reset button mounted in the front and a pre-installed power cord. After that, both the drain housing and grind chamber are made from glass-filled nylon for rust prevention. Even more, the grind components are all stainless steel. The only significant design drawback seems to be the impossibility of removing the splashguard. If you’ve scrolled through our best food waste disposer guide, you already know that Waste King is the top budget brand in the industry. Their models are usually half the price of units from their main competitor, InSinkErator. With the 9930 specifically, you enjoy a high power 2600 RPM motor that chops up food waste like there’s no tomorrow. Although the model tends to drain slowly, it gets the job done admirably. Did we mention that it comes with a lifetime warranty for the grind chamber? You should purchase the Waste King 9930 if you want the best quiet garbage disposal that you can install without professional help. The user-friendly 3-bolt mount system will help you get your disposer up and running in no time. When it comes to food waste disposers, you should always search for rugged. In the end, the purpose of the unit is to rapidly grind food for years on end. The Emerson Evergrind E202 is just what you need to achieve this goal. Although you may not be familiar with the brand, Emerson is actually the parent company of InSinkErator. However, the big difference is that Emerson models are far cheaper than those under the InSinkErator brand. The E202, for example, is around $107 on Amazon. There’s no denying the heavy duty properties of the E202. The model has a galvanized steel construction with a powerful ½ HP Dura-drive induction motor. Still, no matter how rugged the unit is, it has a slim, 6.3 x 6.3 x 12.6-inch profile. In addition, the distance from your sink to the drain outlet port is notably shorter than with other units. On the downside, you do have to buy a power cord separately, but you can add the InSinkErator Power Cord Kit to your cart before checking out. Luckily enough, there are pretty much no complaints at all regarding the E202’s performance. It’s considerably quiet for a disposer with its horsepower rating, all while swiftly chopping food waste. Users also highly recommend it as a replacement unit with a painless installation process. The only true cons appear to be the inferior 1-year warranty and customer service that the Emerson company provides. Order the Emerson E202 if you’re looking for the best quiet garbage disposal that’s also highly durable. Thanks to its smart design, ease of replacement, and smooth operation, it’s a model that’s worth your money. Running low on cash but still want to get the best quiet garbage disposal possible? You should look into options with 1/3 HP motors. Even though they have significantly less power than their ½, ¾ or 1 HP counterparts, models manufactured by trustworthy companies are a bang for your buck. The situation undeniably applies to the General Electric GFC320V. With a current Amazon list price of around $89 and the possibility of getting +20% discounts, you’re in for quite the treat. Aside from being a terrific value, the GFC320V was also designed to be conveniently compact. It measures 5.2” x 5.2” x 12.7” and weighs just 9 lbs. Consequently, it has a low profile that can comfortably squeeze under any average sink. There are mixed feelings among customers concerning the installation process, though. While some claim setup was a breeze, others complained about troublesome instructions. We also like that it’s safe for homes with septic systems. According to consumer reports, one of the top benefits related to the General Electric GFC320V is its low vibration and generally quiet functioning. Due to the fact that it runs on a 1/3 HP motor, it may not perform as powerfully as you’d expect, but it completes the task nonetheless. The majority of users purchase it as a replacement unit for the same model or a similar one. In this case, it turns out to be a satisfying product that is expected to provide the same long life as the previous unit. We suggest you get the GE GFC320V garbage disposal if you want a reliable unit with a 1/3 HP motor. It will cost less than models with higher power, all while grinding up waste exactly the way it’s supposed to. On the other hand, you may be on the hunt for a beast of a food waste disposer. In most cases, this means a high power motor (1 HP or higher) with a massive RPM (2700 or higher). If you tend to “abuse” your disposer and want one that can handle heavy usage, the Waste Maid 658 is the workhorse for you. The standard Amazon price for the model is in the $170 range, but the company is known for offering large discounts that lead to as much as $50 off its initial price. Although there are some substantial faults concerning the Waste Maid 658’s design, there are more positive aspects. First of all, the model comes complete with a power cord preinstalled and removable splash guard. Secondly, you receive a dishwasher outlet in your package as well. Even more, the swivel impellers, armature shaft, and cutting components are stainless steel. Now for the shady side – the unit is large and heavy, while the top neck design is noted to be problematic. Judging that the 658 has a 1 ¼ HP motor that spins at a whopping 2800 RPM, you can only imagine how powerful it is. In fact, for such a fast garbage disposer, it’s surprisingly quiet. If you are strict with the level of noise you accept from your disposer, don’t forget to put the rubber baffle in it. It will make the full operation of the unit noticeably quieter. Other than that, do note that installation is a two-person job due to the model’s weight and the poor instructions provided by Waste Maid. Choose the Waste Made 658 if you value speed in the best quiet garbage disposal. The 658 has an incredibly fast and strong motor that makes far less noise than most other models with similar power ratings. Most of the time, higher horsepower results in a louder disposer. It’s usually the case for units that pack in ½ HP or more. We’re fortunate enough to have models like the Whirlpool GC2000PE that break the stereotype. Even though the GC2000PE does have a powerful ½ HP motor, it’s actually one of the best quiet garbage disposal units out there. If you buy it on Amazon, you can currently get it for as little as $99 new with an extra $15 for shipping. With 14.5 x 7.5 x 7.5-dimensions and a 13-pound weight, the GC2000PE isn’t the smallest disposer on our list, but it’s far from being bulky. Whirlpool has combined two types of steel for the model – stainless for the swivel impellers and galvanized for the grinding wheel and shredder ring. We only wish that the grind chamber wasn’t ABS so it would effectively withstand corrosion in time. In terms of installation, customers are generally satisfied with the GC2000PE’s assembly process. Users are quite surprised to find how quiet the GC2000PE is compared to similar ½ HP models. However, we were disappointed to find that it might get louder in a few months and even start leaking. To prevent such a decline in quality, always be careful with what you put down your disposer. Setting these aspects to the side, Whirlpool’s GC2000PE is a strong disposal that completely shreds food waste while rapidly draining the water that accumulates in your sink. If you want impressive HP without getting annoyed by a noisy disposer, the Whirlpool GC2000PE is for you. Make sure you accurately maintain it so you can get the most out of your product in time. Space is a common issue when dealing with food waste disposers. Even if you do have a good amount of space under your sink, you still won’t want to occupy it all with your disposal. One particular model that you can count on for saving space is the Moen GXS75C. We’ll get into its awesome measurements and benefits in a minute, but we want to cover its price range first. On Amazon, the Moen GXS75C can be between $125 and $139 right now, depending on promotions. It’s obvious that the GXS75C’s design is one of its high points. The unit has compact dimensions, measuring 5.4 x 5.4 x 13.4 inches. Consequently, you won’t have any troubles making it work for your home, regardless of the under-sink room you have available. In addition, this Moen model has advantages like a preinstalled power cord or Universal Xpress Mount. In other words, the unit is simple to install and comes with everything you need. The Moen GXS75C runs on a ¾ HP motor with 2700 RPM, making it one of the fastest models we have selected. Indeed, it is on the loud side compared to other disposers we reviewed, but its Sound Shield insulation helps keep the noise down. The good part related to the powerful motor is that it can chop up even tough waste, such as potato peels. Some users have pointed out inconsistencies in speed or potentially short product life, but we recommend it as a fine model. 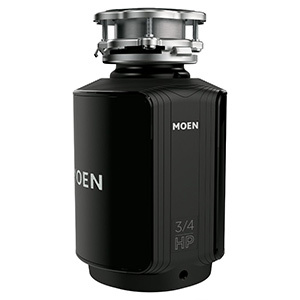 Choose the Moen GXS75C if you want a high power garbage disposal that still has a compact and quality construction. You can count on it regardless of the space you have or what type of food waste you normally deal with. Even though the Moen GXS75C is a fine ¾ HP garbage disposer, we have another model with the same horsepower rating that surpasses it. 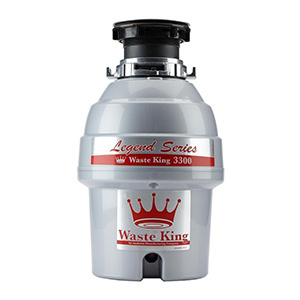 We gladly recommend the Waste King L-3300 as the best quiet garbage disposal that runs on a high power, ¾ HP motor. Currently available for approximately $125 on Amazon, the L-3300 has a nice 4.3-star average rating for customers. It’s fast, effective, and one of the best Waste King disposers that won’t make a lot of noise. 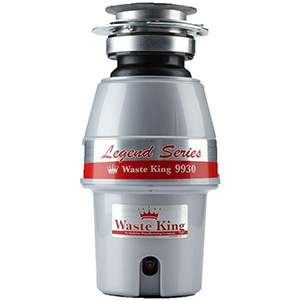 Waste King disposers are known for delivering satisfying quality for a reasonable price. The same goes for the L-3300 – it features stainless steel parts like the sink drain flange and internal grind chamber. You should note, however, that a portion on the top of the disposal contains plastic. As far as assembly is concerned, Waste King’s trademark EZ Mount allows you to install the unit without any professional help. At 10 pounds, the L-3300 is also quite lightweight. Products unfortunately don’t always live up to their advertisements. Thankfully, it’s not the case for the Waste King L-3300, which is praised for even exceeding expectations. Owing to the Sound Insulation technology, the L-3300 won’t be a nuisance in the kitchen. We find this to be an amazing quality for a ¾ HP motor that spins at a whopping 2700 RPM. We also believe the 10-year warranty Waste King provides is amazing, but, sadly, it’s reported to be difficult to access. Choose the Waste King L-3300 if you want to enjoy extreme power that doesn’t come with loudness. The ¾ motor it comes with will admirably dispose of challenging foods, performing just as well as you hope it would. Generally, we always recommend spending a few more bucks on quality disposals instead of resorting to cheap models. A proper model should easily withstand 5-10 of use. Notwithstanding, we know that not all customers can afford to spend $100 or more on their unit. Happily, there are inexpensive options like the Frigidaire FFDI331DMS GrindPro that still provide quality. It can cost as little as $60 when on sale on Amazon (but make sure you check the current price). The Frigidaire FFDI331DMS GrindPro is a direct-wire unit that has 7.7 x 7.7 x 13.4-inch dimensions. It weighs only 10 pounds, so it’s a breeze to install on your own. Users back the model up for having a very solid feel to it, including its parts. The GrindPro has a complete stainless steel grinding system, reducing the risk of corrosion. Still, it has some design shortcomings that may impact its long-term performance. For instance, there is no port for un-jamming, if ever necessary. Don’t let the 1/3 HP rating fool you. 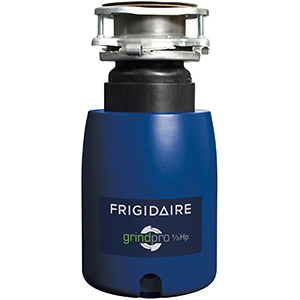 Frigidaire’s GrindPro doesn’t have any troubles gobbling up food waste just like a high power disposal. It’s significantly quieter than numerous other models that cost twice as much. The model functions on a continuous feed magnet motor that performs wonderfully. It may not have the high-tech features that pricey competitors offer, but – at the end of the day – it delivers exactly what the best quiet garbage disposal should. Select the Frigidaire FFDI331DMS GrindPro if you’re tight on money but still need to buy the best quiet garbage disposal. You won’t be sacrificing long-term quality despite the small amount you’ll be spending for it. Anyone who has dealt with food waste disposers before knows that InSinkErator is a market giant. The company manufactures some of the most popular models among homeowners, dominating the best-seller charts (together with Waste King). 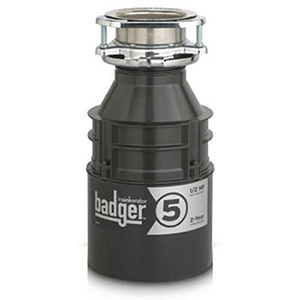 Although we’ve talked about the Badger 5XP in our guide for the best garbage disposal to have this year, the InSinkErator Badger 5 (around $95-$190 on Amazon) is the most well-known from the brand and the best quiet garbage disposal of 2018. 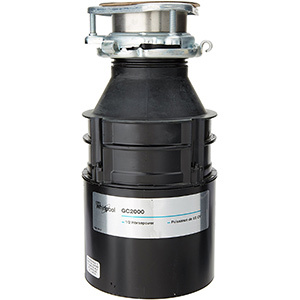 Not only is the Badger 5 the most popular InSinkErator garbage disposal, but it’s also one of the most recognizable disposers of all. It has just a bit of everything you want from a good disposer without needing to spend a fortune. Despite that it doesn’t come with a power cord, there are packages available that include one. Speaking of packages, the Badger 5 comes with everything else you’ll need, from a stopper to a discharge tube, flange, gasket, hardware, and even a jam-buster wrench. As far as performance is in discussion, the Badger 5 is exemplary. It proves that even a 1725 RPM motor can eliminate all types of waste, even diminishing bones. Customers compliment the model for having a long product life, but also for being a quick and reliable replacement unit for sinks with a similar setup. Furthermore, it’s currently one of the top-rated best quiet garbage disposals models, with a stellar 4.5-star rating from almost 5,000 reviews. Pick the InSinkErator Badger 5 if you desire the best quiet garbage disposal that countless other customers have been recommending for years. It’s easily the most popular model on our list, and all for a very good reason. The Badger 5 is powerful, reliable, easy to replace and use, all in one. In closing, you should always spend some time on research before splurging on the best quiet garbage disposal on impulse. There are plenty of alternatives available to meet all needs, whether you want a quiet and compact unit or a high power disposer that doesn’t make all that much noise. Last but not least, be careful with what you put in your garbage disposal to ensure you get a long and happy life out of your product. Enjoy! The reason we are looking into getting a quiet garbage disposal system is that our old one was very noisy and it also scared our toddler everytime it was used. He is very sensitive to loud noises. This list of quiet ones is good and we will look into each one before making a decision on a purchase. We’re happy that you can use our guide for finding the best quiet disposer for you. Let us know if there’s any other information we can help out with. 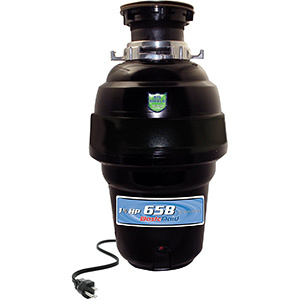 If noise is a concern then the best quiet garbage disposal is the Waste King 9930. Not only is it quiet but it is very easy to install. This is ideal for those who have young families and don’t have the time to install anything complex. Thanks a lot for your feedback! Have a great day :). I had the Badger 1 and that lasted around 7 years which was plenty for me. Now I got the Badger 5 to replace that and I’m happy with it. It’s easy to set up even for a beginner, it does great job (seems better than my old model) and I can only hope it will be as durable (maybe not 7 years, but at least 5). Oh, and I forgot to mention that it’s quieter than the older model and that wasn’t very loud either. We’re glad you found the right product for your needs. Badger is indeed a great brand with high-quality products. I was recommended to get the Waste King 9930 because it was easy to install and it is quiet and both are quite true. The price is not bad either. I am happy to see that this one ended on your list. I would not get the Emerson Evergrind E202 if I were you. The product itself is okay but the customer service is horrific. Whenever I have had issues with mine, no one at the company really took my concerns seriously and were anything but approachable. Thanks for sharing your experience. We’re sorry you had to deal with that, it sounds really unprofessional. What other product would you recommend? I also agree that the Waste King L-3300 is the quietest garbage disposal around. I actually ended up having that one installed right after we had purchased and inspected our new home. I am glad to have made that choice. We had the Emerson Evergrind E202 garbage disposal installed in our kitchen and I must say I am happy with the product as it is efficient and quiet enough to not disturb anyone. But the customer service is not what it should be. Thank you for taking the time to share your opinion! What experience did you have with the customer service? We’re sure our readers will find it useful when choosing the right product. That is interesting. We are selling our house, and the new house that we are interested in does not have a garbage disposal. However, we want to have one installed. Our realtor told us to not even think of touching the InSinkErator. After reading the disadvantages, I can see why. I have noticed some commenters knocking down the Emerson Evergrind E202 garbage disposal. But isn’t poor customer service a common issue in general? I would not trash talk this product due to the poor customer service alone. If it does its job, then that should be good enough. 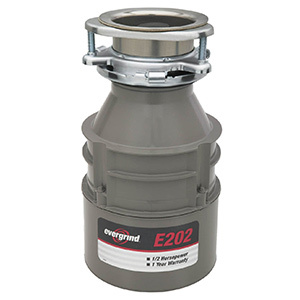 I have not had experiences with other garbage disposals other than the Emerson Evergrind E202 and it seems to work quite well, and the noise is kept to a minimum. I noticed that customer service is bad based on what is written but I would not know because I rarely used it. The InSinkErator Evolution Septic Assist is really quiet and it fits our needs (septic system), and thanks for putting this out there. It is extremely quiet and that is helpful when there is a baby in the home. When the baby sleeps, we are happy. I am looking for a garbage disposal and a quiet one is definitely a bonus, but I am not sure where to even start, and what to even consider when I buy. I have never had one before so this is new to me. Hi, Alanis! Well, you’ve come to the right place. You’ll find all the information you need in our list. We believe you’ll be very happy with the InSinkErator Badger 5, but all options are great products that do their job wonderfully. And if you’re not satisfied with your purchase, you can always ask for a refund. Oh I am so glad to have come across this. I am pregnant and I am going to need a quiet garbage disposal as my old one is starting to conk out. I want to make sure whatever I purchase will not wake the baby.